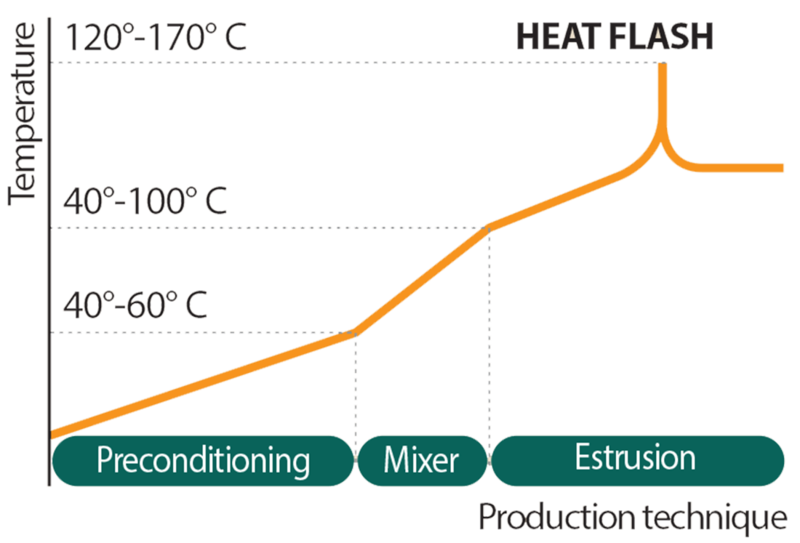 This technology combines heat, pressure and time that causes an instantaneous rise of the product’s temperature (heat flash), followed by a fast cooling phase to prevent denaturation. Cereals treated with Cortal Extrusion Technology have a more digestible starch level than those treated with other technologies in the market. At the intestinal level, the risk of colic and gastritis decreases and the diet efficiency can be increased even in excitable horses. Adding Cortal extruded feed to the horses’ diet improves the functionality of the intestinal system and its ability to digest the NDF, i.e. the fiber composed of cellulose, hemicellulose, lignin and cutin, which naturally increases the digestibility of the whole diet. Cortal Extrusion Technology reduces the charge of microorganisms present in raw materials (bacteria, mold, yeast), eliminates pathogens (Enterobacteriaceae) and sanitizes the feed without using chemicals. It also allows specific temperatures to destroy all anti-nutritional factors (i.e. linamarin in linen, urease in soybeans, etc.) and further greater digestibility of feed. The thermal process disables fat oxidation (lipase) and hydrolysis of proteins (protease), which increases the product shelf life without resorting to artificial preservatives, thus maintaining the horse well-being.